The Arroyo Seco Foundation seeks volunteers skilled in photography and video production. We use a lot of graphics, pictures and videos on our website and social media to illustrate the work we do to protect the natural environment and watershed management in the Arroyo Seco and the Los Angeles River. 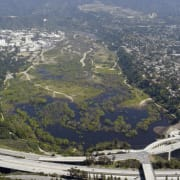 Currently we are especially interested in documenting the destruction of one of Southern California's greatest environmental treasures, Hahamongna Watershed Park. The Los Angeles County Flood Control District has failed to maintain a safe level of sediment behind their Devil's Gate Dam at the bottom of the Hahamongna basin for many decades. Now they are moving ahead to conduct a massive excavation and trucking operation in the precious habitat of Hahamongna to remove 1.7 million cubic yards of rare native plants, rocks and soil over the next five year. They plan to dig a fifty acre pit in the bottom of the basin and to permanently destroy high quality habitat in that pit each year. Most special environmental treasures like Hahamongna have been destroyed in Southern California, and we continue to resist the outdated and destructive Big Dig program sponsored by LA County. We need skilled photographers and videographers to document the devastation of Hahamongna. Immediately. We need to document the rich habitat that now fills up the basin, and we also want to record their five year destructive program so that there will be a record of future generations of this atrocity. We are also interested in documenting the events the foundation sponsors on a regular basis as well as features like the history of the Arroyo, the preservation of fish and wildlife in the Arroyo and the Los Angeles River, and other matters. This is a great way to use your skills to make a difference promoting environmental awareness and sustainability. We hope you will sign up right away. Demonstrated commitment to environmental causes; samples of photograhy and video work.